The Surprising Story Behind "The 36-Hour Day"
I thought I knew every word in the book - The 36 Hour Day - like many families, it was our Alzheimer's caregiving "bible". It's what I didn't know about The 36 Hour Day until I visited at length with author, Dr. Peter V. Rabins that surprised me most. The 36-Hour Day a book that has been so successful that is has spawned five editions since 1980, enjoyed sales in excess of 2.5 million copies, not including mass market paperbacks. The 36 Hour Day remains the leading resource for caregivers, and was actually VERY close to NEVER being published at all! In fact, it was turned down repeatedly. Rejected outright by no less than TEN different publishers, who labelled it a "niche" publication that wouldn’t have enough need or broad appeal to be profitable. Major publishing executives even scoffed at the initial title, "Family Handbook" pointing out it didn’t give readers any clue as to what to expect to find in the book. The authors of The 36 Hour Day very nearly gave up on the whole idea of trying to get this information out to the public, except for one very important thing. The authors knew just how wrong those for-profit publishing houses were. In the mid-seventies, most doctors and nurses had never heard of Alzheimer's and their level of familiarity with dementia was just starting to be acquired one patient at a time. As a young neuro-psychiatrist in the mid-1970's, Dr. Peter Rabins came to Johns Hopkins University after completing his Psychiatric residency at Oregon Health Sciences to study more about brain diseases like Lupus, Multiple Sclerosis and Traumatic Brain Injury under the inventor of the Mini-Mental Status Exam (affectionately known as the MMSE), Dr. Marshal Folstein. Dr. Folstein welcomed his eager new colleague with an unexpected assignment; he would be assigned to work one day per week in Johns Hopkins Memory Clinic. "By the late 1970s, Alzheimer Disease was becoming more widely known but remained barely understood among the general public as the cause of dementia and memory loss in older patients. Managing the condition medically within psychiatry or geriatric departments was becoming more common, and the psychiatry department at the Johns Hopkins Hospital was one of the first in the nation to establish a special unit for patients with dementia." This unit also gave rise to some of the first official support groups in the country. Held monthly, these town hall style meetings held on campus at Johns Hopkins gave those newly diagnosed with dementia and their caregivers a chance to come together for information and fellowship at a time when a new organization called The Alzheimer's Disease and Related Disorders Association or ADRDA (which would later become the National Alzheimer's Association's we are all familiar with today) was just getting started. These meetings became a lifeline for both persons and practitioners looking for any information they could get their hands on to help them better understand the cluster of dementia symptoms they were seeing. They learned early on that the best way to facilitate these meetings were to give an overview of the disease for the first few minutes and then use the rest of the time for the participants to ask questions. And boy, did they have questions. How and when to pick a nursing home, reduce the risk of wandering, cope with aggressive behaviors and manage incontinence-the questions kept coming and so did the gathering of needed resources to meet these needs. Dr. Rabins and his nurse, Nancy L. Mace kept getting requests for written materials detailing the information they were sharing verbally in their monthly talks. They began by making one pamphlet for each talk or topic. The most commonly asked questions became pamphlet topics and later chapters in what would later become their book. It was Dr. Rabins' boss, Dr. Paul McHugh who suggested that a formal publisher be sought out after Dr. Rabins' secretary ended up spending countless hours at the mimeograph machine keeping up with the request for copies of the material from all across the country-at the rate of hundreds of requests for each pamphlet every month! After traditional publishing routes ended in unanimous rejections, The Johns Hopkins University Press agreed to take on the task of producing the book. Still, the challenge with the title remained. Many title ideas were bantered about and rejected for various reasons. The iconic title we are so familiar with today didn’t even come from anyone directly involved with Johns Hopkins or even the writers of the book. After Dr. Rabins heard a Seattle area husband give a radio interview where he described his experience as a full-time caregiver for his wife with dementia as the equivalent of "Living a 36 hour day every day", well the rest as they say, is history. After a career spanning over 4 decades in medicine including serving as a professor and the Director of the Division of Geriatric Psychiatry in the department of psychiatry and behavioral sciences at the Johns Hopkins University School of Medicine, joint appointments in the department of medicine, and in the departments of Health Policy & Management and Mental Health at the Johns Hopkins Bloomberg School of Public Health, Dr. Rabins has been on faculty at Johns Hopkins since 1978. Now, semi-retired and an avid gardener when he does get time off, Dr. Rabins maintains an office at Johns Hopkins and continues his focus on the effectiveness of current therapies for Alzheimer’s disease, the development of measures of quality of life in persons with Alzheimer’s disease, the care of patients with late-stage dementia, and autism in the elderly. The feedback Dr. Rabins receives from readers of The 36-Hour Day over the years often includes, the ease with which needed information can be found and referred to quickly via the index without having to read the whole book; and, the comfort in knowing that readers are not alone in what they are experiencing after reading about others going through similar situations within the pages of what has become the most recommended resource in the field of Alzheimer's care. I was curious about Dr. Rabins thoughts on where he felt we were with current research efforts and if families like mine had any new reasons to hope for a cure today then we did when he was just starting out. Without a single pause, he enthusiastically shared that "Now more than at any time in history more researchers are working on identifying the cause, looking for a cure and the possibility of prevention." He noted that more dollars than ever are being allocated to the work that he and his colleagues pursued at a time when "senility" was the most frequent reference in the medical chart and considered a forgone condition of aging patients that wasn't worth much in-depth examination. He also noted that there is more global recognition and cooperation between researchers than at any time in history. Though there are many reasons to be optimistic, he is also realistic about the pieces of the Alzheimer's puzzle that still remain a mystery. "One of the challenges of science," Dr Rabins shares, "is that you have no idea what's going to happen at any given time. What keeps it exciting and exasperating all at once for us as researchers is that you never know when you are an hour or a lifetime away from a breakthrough. It keeps you fighting, keeps you trying, and keeps you giving it your all." He continues to note that many researchers agree on "the need for a truly accurate biological test for Alzheimer's. However, to be accurate it has to accurate 100% of the time in identifying when Alzheimer's IS present and accurate 100% of the time when it is NOT present." We are still a ways away from that and we still don’t full know the correlation and role between amyloid and tau proteins the way we want to. 60-70% of persons over 65 have significant buildup of Amyloid protein present on their brain scan but are without Alzheimer's or dementia symptoms. It may be that Alzheimer's, like different types of Cancers, will be determined to be disease without a single cause but rather a combination of environmental and genetic contributing risk factors than in concert produce the ideal environment for the disease to develop. "This is an optimistic time in terms of not only the research and funding but also in the increase in the level of interest on the part of the general public to participate in promoting brain health." Dr. Rabins encourages those newly diagnosed to get as much information as they can, but even more importantly to ask as many questions as they can. "I always tried to create a therapeutic relationship with my patients and their caregivers. I was there to let them know as little or as much as they wanted to know about what to expect, what was coming next and most importantly, what we could do about it as a team, in other words, that we were in this together." The feeling that we are in this together is one that Dr. Rabins shares with not only the patients who were lucky enough to call him their doctor in those early days, but now also the millions of us that read and re-read his words to help us cope with a disease that creates more questions than answers at every turn. The notion that The 36 Hour Day, though updated roughly every five years to reflect changes in medical, bio-medical, medication, insurance and to some extent Alzheimer's interventions still consistently occupies three out of the top ten spots on Amazon's Alzheimer's best-sellers list is pretty incredible. Written before assisted living was even a recognized industry, before there was a national Alzheimer's Association, before cell phones or computers were widely available, at a time when the Rubik's cube and Empire Strikes Back were occupying much of our nation's free time and long before this little known disease would become the nation's sixth leading cause of death, decades before there would be another 8,000 books about Alzheimer's/dementia to choose from-there was only one, this one. The 36-Hour Day. The fact that this one book has still managed to stay relevant and useful for thirty four years, six United States Presidents and millions of new Alzheimer's cases later is a testament to the competence and compassion of the team that curated it's content and remains the guardians of its' enduring legacy. Thank you Dr. Rabins, to you, Nancy Mace and your whole team for ignoring those that questioned the usefulness of the information you knew we needed and wanted. Generations of practitioners, patients and care partners share our gratitude and admiration for taking on a monumental task that became a legendary resource. You life's work has changed forever the way we think about, talk about, treat and cope with dementia (including Alzheimer's). On behalf of my fellow families impacted by dementia, you will always have both our affection and admiration. 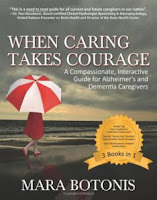 Mara Botonis is the author of When Caring Takes Courage. You can learn more about Mara here.